Miksha and parsha of shel yad. Am I missing something? I find that by miksha batim, in the shel yad, many expert sofrim are not makpid that the whole parsha should be in the bayis, and if part protrudes into the titura they are not the slightest bit concerned. 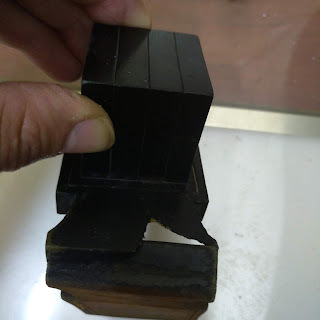 In fact, the most mehudar tefillin I check, sold with all the top hiddurim including miksha batim, often have the shel yad parsha protruding deep into the titura. Yet by non-mikshah batim, these same experts consider it to be a chisoron in hiddur if the above occurs. They hold this (of it being a detraction in hiddur) even when the parsha does not descend deeper than the titurah elyona or the part of the titurah that is made of the same piece of hide as the bayis. So what am I missing here? If the whole reason why we are not worried about the parsha protruding by miksha is because it's the same ohr in the titurah as the bayis, why be concerned in regular batim when the parsha does not protrude lower than the "filler" and still stays in the space of the upper ohr which is the same ohr as the bayis as well? If someone could fill me in, I would like to understand this discrepancy. Firstly, my question above is not really relevant to shittas Chabad, rather the general oilam, where miksha is more prevalent. Perhaps Rabbi Traube or Rabbi Atkotzky can shed some light on this. Regarding shittas Chabad as well as other shittos on this issue, as mentioned previously on this forum I struggled with this issue for a long time. From the Shulchan Aruch Harav it is unclear because the titurah of the old dakos batim (which the A"R describes) and gassos batim today are inherently different in structure. In my early days of checking I used to mention it to people who's tefillin I checked, some of whom changed their yad batim to deeper ones. However I learned after some time that perhaps I was being overly machmir on this issue, and I discussed this issue with the late Rabbi E. Zirkind who told me that there is only an issue if the parsha decends into the space of the filler in the titurah (ie the added piece which is stuck to fill in the titurah). 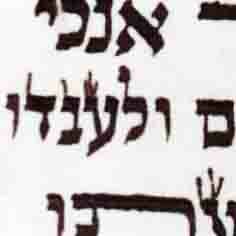 However if the parsha (lettering) decends only into the upper titurah, which is made of the same ohr as the bayis, it is no problem whatsoever. I discussed this with Rabbi Moshe Shoel Klien shlitah of Rabbi Vosner's Beis Din as well, so I could have a psak for my non Chabad customers. He told me the same thing, and that the tefillin are mehudar so long as the parshiyos do not extend past the filler. Having said that, I try as much as possible to buy deep batim shel yad so that this is a non issue for items I sell. If someone could please explain the mikshah anomaly, I'd me most obliged. You are right, in the yad there is no difference between miksha and the others as long as the titura elyona is one leather with the bayis - then it is considered "or echad". But the filler is not the same "or" as the bayis - so therefore would be peshutim (stuck leathers together). I guess they are machmir on the tefilin with filler - not to differentiate any part of the titura "ma'chashash l'michsol"! In most batim (miksha included) there is lots of synthetic glue in the titura and therefore a problem of chatzitza if the parsha goes there, so I'm not sure how miksha solvs this problem unless u get batim that r made with hide glue only. There is no reason to differentiate between the titura of miksha and the upper titura (not the filler) of regular batim. To clarify, the issue is whether the ksav, not the klaf below it, can be in the airspace of the titura. Rav Ovadia seems to hold that lechatchila the ksav of the shel yad must be within the bayis. Rav Vosner writes the same thing so Rav Klein's psak is interesting since he seems to allow it no only to go into the titura but even opposite the filler. Rav Elyashiv didn't require the ksav of the shel yad to go all the way into the titura and it is still mehudar. When I asked Rav Friedlander not long ago about this as I wanted to know if having the ksav all the way into the bayis was a "chashuve hiddur or a high end hiddur he said that the titura on gasos is part of the bayis and he didn't feel that it was that important. Zichron Eliyahu brings down that the Chazon ish wasn't makpid but the Steipler was makpid, at least for himself. The sefer says that the minhag of doros hakadmonim was not to be makpid and there's a smach for this in the Rishonim. While there are achronim who pasel if the parshios (shel yad as well) go into the titura, it needs to be clarified if they were in the pregasos times or if at least they were talking about gasos as they may not be a proof as the titura of gasos may be different that dakos/peshutim. The fact is that 99% of the batim, besides some of the high end, private made batim, even when the bayis is 35-37mm tall, are not deep enough to get the ksav totally inside and requires deepening. My hargasha is to be makpid on mid-higher level mehudar tefillin but it's a hassle and comes with some risk. I offer it as an option to customers ordering such tefillin. Mendela- There are plenty of batim that have glue in the bayis itself. Preferably batim should be checked and cleared of glue. Rav Elyashiv didn't require the ksav of the shel yad to go all the way into the BAYIS and it is still mehudar. I know there is no difference between mikshah and regular batim in this issue. Hence my bewilderment as to why so often I find miksha where the yad parsha goes deep into the titurah. 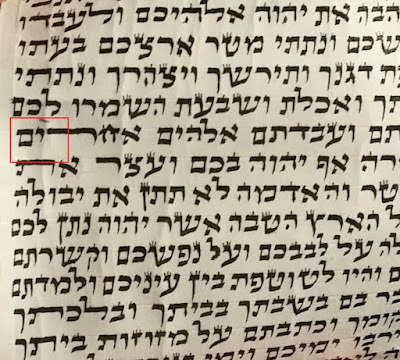 My only explanation is that miksha batim are made of thick hides, and perhaps the extra thickness (of the gug) reduces the space in the bayis, minimizing the chances of a normal sized parsha fitting completely into the bayis. So perhaps the logic is that miksha is a bigger hiddur than having the shel yad completely in the bayis, so lets not care if it sticks down a bit. Perhaps the batim machers should make the miksha yadin a little taller to accommodate the extra thickness of the gug. Or the guys writing parshiyos for miksha batim should use slightly shorter klaf. That way you can get both hiddurim. I'm only aware of one of the recent gedolei haposkim who held miksha was a hiddur. Miksha seems to be very far down on the hiddur "pole" so the ksav going into the bayis would be a more desirable hiddur. The batim machers should make at least all more mehudar batim, mishka or otherwise, (such as ribua regel) with chalalim to at least contain the ksav of 32mm yadin. The fact is the vast majority of batim, even when the height of the batim are 35-37mm typically have chalalim of only around 29mm tall. From my experience, batim with sufficiently deep chalalim are only available from a number of private makers. Most sofrim have no idea which batim their parshios will go into as most write for dealers and many writing privately aren't told which batim the customer is planning to use. 32mm is the shortest standard height and there's no reason why the sofrim should write smaller. The batim should be made according to the accepted standard height of parshios. Many sofrim writing 34mm tall for their own convenience or so they should look nicer are not familiar with hilchos batim and don't realize that they are making it more difficult, if not impossible to get the ksav fully into the chalal. The bottom line is if the parshios are to go all the way into the chalal shey yad it is up to the one selling the batim/machnis the parshios to either get from a source that makes with deep enough chalalim or to deepen them ourselves.